Cisco Interface Card WIC-1SHDSL-V3 Interface module kopen? | That's IT! Cisco WIC-1SHDSL V3 module. Gebruikt maar in prima staat en bulk in antistatische verpakking. 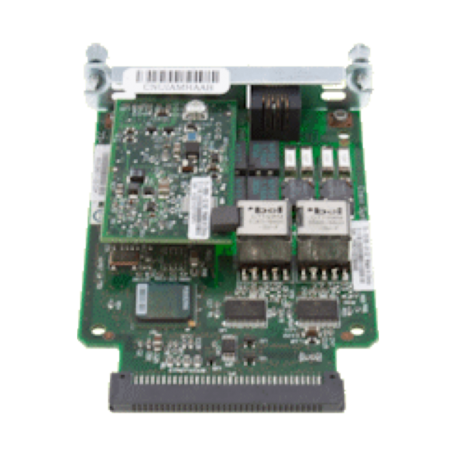 The new G.SHDSL WAN interface card (WIC) provides 1-port symmetric high-bit-rate DSL (SHDSL) connectivity to a WAN. 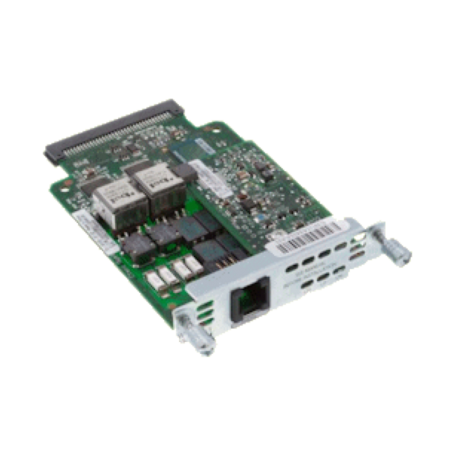 The modular routers that support the new card are the Cisco 1841, 2801, 2811, 2821, 2851, 3825, and 3845 series integrated services routers; the Cisco 1721, 1751, 1760, 2600XM, 3725, and 3745 series multiservice access routers; and the Cisco 2691 Multiservice Platform. The interface card is available on Cisco access routers, starting with Cisco IOS ® Software Release 12.4(3) Mainline and special Cisco IOS Software Release 12.4(2)XA. The first T-train image that will support the new interface card will be 12.4(3rd)T.
The new interface card is the latest G.SHDSL-based WIC for Cisco modular routers. It supersedes existing interfaces (part numbers WIC-1SHDSL and WIC-1SHDSL-V2) while maintaining feature parity with WIC-1SHDSL-V2. The WIC is supported on all modular Cisco integrated services routers-the Cisco 1841, 2801, 2811, 2821, 2851, 3825, and 3845. It is also supported on the older multiservice routers-the Cisco 1721, 1751, 1760, 2600XM, 2691, 3725, and 3745 routers. The new WIC is supported on these access routers using the Cisco IOS IP Base feature set and up. For the Cisco 1700 Series, the minimum Cisco IOS Software feature set required to support the card is IP/ADSL or IP Base. The routers listed previously need to run Cisco IOS Software Release 12.4(3) Mainline and above or 12.4(2)XA to support the new WIC. The interface is also supported in Cisco IOS Software Release 12.4(3rd)T and above. The system requires no additional flash or DRAM memory other than the specified minimum memory for the Cisco IOS Software releases listed. No slot placement restrictions are placed for the new interface card on any of the platforms. Alternatief Cisco-partnumber: 800-26571-02 B0 of 800-26571-02 C0.